Call from anywhere & everywhere! In November, local activist and single mother Siham Byah was detained by ICE during a routine check-in with immigration services. Her son Naseem was taken into DCF custody, where he was placed in the care of strangers despite Siham's request that he be sent to a friend's family who were willing to take him. Two weeks ago, Siham was deported suddenly and despite a pending legal case. She was not even able to say goodbye to her son. Naseem was not informed of the deportation, and DCF is denying Siham communication with her son. 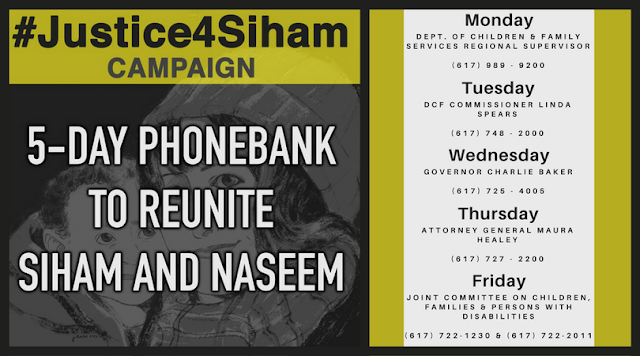 We are calling on Siham's supporters to take part in a week-long phonebanking campaign to DCF and various elected officials to demand Siham be reunited with her son. Learn more details of Siham's case and stay updated on the latest news at Justice4Siham.com.